I've had the itch lately to try something "different". A couple of autumns ago Karen, my brother Doug and I went to the Georgia State Fair. I felt that the event would provide some interesting photography so I brought along my Fuji. 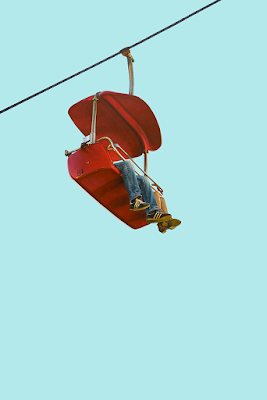 The next day I was going through my photos and came across a half a dozen shots of peoples legs and feet hanging out of the skybucket as the passengers were towed above the fair grounds at dusk. I always liked those images but feared they were just a little too "different" from what I usually paint, and may not be positively received. So I banked those photos for the last couple of years waiting for the right moment. I finally built up the nerve and now that it's done, I have to say I'm pretty happy with it. Neil, I've been reading your blog for years. I love the artwork both you and Karen bring to us. It's true that if a person wants to make their living from their art, they have to develop their own recognizable style. I find it a little sad that artists have to resist inspiration that threatens to take them in a different direction. This painting is sure to evoke pleasant memories for many people as it did for me. What a loss to us and to yourself if you hadn't painted it. I'm so glad you did.